This year's show runs January 28-31. CHICAGO, January 27, 2010 – Exhibitors at the first nine of this year’s National Marine Manufacturers Association (NMMA) boat shows—the New York Boat Show; Kansas City Boat & Sportshow; Nashville Boat & Sportshow; Minneapolis Boat Show; Chicago Boat, RV & Outdoors Show; Baltimore Boat Show; Louisville Boat, RV & Show; Atlanta Boat Show; and, Toronto International Boat Show—are reporting better-than-expected sales and buying crowds with boats selling in all categories. Early reports indicate dealers are writing contracts and selling boats at the shows, as well as walking away with solid sales leads to pursue in the months ahead. NMMA supports each of its boat shows with a comprehensive local and regional marketing program while leveraging the industry’s Discover Boating campaign on a national level. Results this year have exceeded expectations with public relations, interactive and advertising programs creating momentum leading into each show, helping to further promote the affordability of boating and the allure of the boating lifestyle. What’s more, the NMMA Advantage program has delivered thousands of visitors to NMMA boat and sportshow websites to view participating dealer inventories, driving traffic onsite and additional awareness for exhibitors’ offerings. “Phenomenal show. I feel sorry for the guys who didn’t come,” says David Schmitt from Buster’s Marine. “Attendance has been really great. Good, quality people coming and they’re interested in buying at the show. We’ve surpassed our sales goals already!” reports Bob Sutherland from BRP U.S.
“This year’s Chicago Boat Show not only exceeded our expectations but was a much needed breath of fresh air. If this show is a barometer for the selling season, it’s going to be an exciting year,” notes Dennis Radcliff of Monterey Boats. “We are having a great show. NMMA really brought in the buyers this year. We are selling pontoon, fiberglass and aluminum boats,” reports Jeff Siems of Blue Spring Marine. “We had so many hits from NMMA Advantage in late December and early January it was just like summer again! We are able to track hits to our website and know where they came from,” says Haleigh Tague, IT manager for Lake Viking Marine. Ray Anderson of Anderson Marine noted, "Everybody is happier, more upbeat and ready to buy." Anderson sold 20 boats at the show. Stuart Fraser of Clark Marine Sales echoed, "People were ready to buy again. Last year, people were just looking and didn’t want to talk. This year, they were interested, asking questions and ready to buy. I doubled my sales from last year." “I haven’t seen this much traffic in years – it’s like old times!” reports Randell Gibson of Kentucky Trophy Fishing. “I’ve sold six and have a stack of quotes to follow up for the next two weeks,” says Steve Webb of Admirals Anchor. “In a word, speechless! We sold nearly every boat on the floor and have several 2010 models on order. We are up nearly 40 percent compared to last year. This was an extremely profitable show for us,” explains Scott Cunningham of Singleton Marine Group. “We are very pleased with the turnout. We sold our two largest boats (391 Meridian and 45 Sea Ray) plus several other models in our line up,” says Kyle Johnson of Marine Max. NMMA boat shows continue through March. A full list of shows can be found online at BoatShows.com. About Natonal Marine Manufacturers Association: National Marine Manufacturers Association (NMMA) is the leading association representing the recreational boating industry in North America. NMMA member companies produce more than 80 percent of the boats, engines, trailers, accessories and gear used by boaters and anglers throughout the U.S. and Canada. The association is dedicated to industry growth through programs in public policy advocacy, market statistics and research, product quality assurance and promotion of the boating lifestyle. For more information, visit www.nmma.org. In Exactly 24 hours the doors will open for the largest indoor boatshow in North America. With the blast of artic weather, this is just what every sailor needs- the chance to come indoors in a warm building (75 degrees) and walk/talk boats. It surely beat watching America's Cup reruns on television! So come on down and visit Karma Yacht Sales your Lake Michigan Beneteau Specialists at Strictly sail. We will have the Beneteau 34, 37, 40 and the Lake Michigan favorite-First 36.7 (Still known as the fastest growing one-design fleet ). It's a great opportunity to come down and start your boating knowledge, continue your boating knowledge or as we'd like to refer to it 'live the lifestyle'. Karma Yacht Sales will have special equipment pack specials on all our boats ordered or in-stock. So come on down and visit. For details on the show. 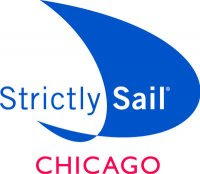 Where: Strictly Sail is located at Navy Pier, Festival Hall A&B, 600 East Grand Avenue, Chicago IL 60611. Save on parking at Navy Pier! Navy Pier will offer sailors $10.00 discounted parking at Navy Pier during the show. (see the show office on the East end of the pier for details). MARINA DEL REY — Looking calmer than the adults crowding the dock, 16-year-old Abby Sunderland nosed her custom-equipped yacht toward the sunny Pacific Ocean on Saturday morning to launch a controversial bid to become the youngest solo sailor to circle the globe. Sunderland's boat-builder dad, Laurence, broke down in tears while talking with reporters and well-wishers at the Del Rey Yacht Club, and family and neighbors cheered as they watched the 40-foot craft called Wild Eyes chug out through the marina's main channel. But the Thousand Oaks girl wore only her usual determined expression as she gave a quick hug to Laurence and nary a wave or a glance back at land before beginning her 24,500-mile adventure with a quiet nudge of the tiller. At least her parting words a few minutes earlier had left 'em laughing. As Laurence checked over the high-tech yacht one last time, Abby stepped back onto the dock for a moment, and mother Marianne asked what she was doing there. "I'm enjoying the concrete while I've got it," Abby said softly. 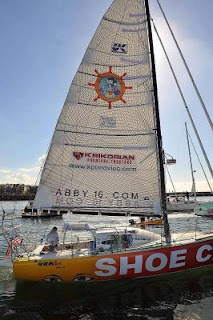 She plans to be at sea for five or six months - alone but able to communicate with her family and troubleshooters via solar-powered satellite telephone and with supporters through her Web site abbysunderland.com. Having turned 16 on Oct. 19, she is chasing a record now held by British 17-year-old Mike Perham, who took the mark last August from Abby's brother Zac. But Perham's mark could be beaten soon by Australia's 16-year-old Jessica Watson, born five months earlier than Abby and currently in the middle of a round-the-world solo voyage. Zac was 17 when he completed a 13-month trip last July, heading west across the Pacific. 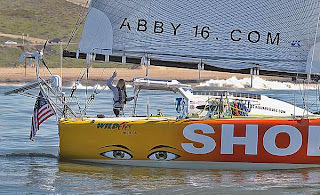 Sixteen-year-old Abby Sunderland of Thousand Oaks stands on her sailboat, Wild Eyes, as she leaves for her world-record-attempting journey Saturday, Jan. 23, 2010, in Marina del Rey. Sunderland is attempting to be the youngest person to complete a nonstop, unassisted solo-circumnavigation of the globe by sea. (AP Photo/Richard Hartog) Central and South America, east around Cape Horn past South Africa, across the Indian Ocean and past Australia before a stretch run east across the Pacific. 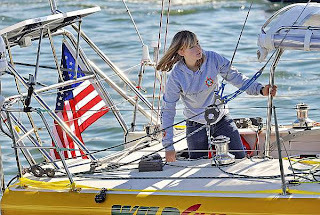 The nonstop itinerary would give her an added distinction as the youngest person to sail around the world "unassisted," topping Australia's Jesse Martin, who did it at 18 in 1999. To look at her Saturday, Sunderland might have been any teenager setting out for the weekend trip to the mall. She wore a red jacket over a gray hoodie, jeans and flat-soled sneakers. Her blond bangs fell over one of her blue eyes. Family friend Michael Goode sent her off by blowing a fanfare on his cornet. But Abby appeared so matter-of-fact at the big moment, it was easy to forget recent weeks of anxiety, the journey having been delayed while Laurence and crew made adjustments to the boat and everyone waited for local storms to clear. After announcing an 11:30 a.m. departure, she actually left the dock with her digital watch showing 10:57. "I feel really excited and really happy I'm finally trying to do this, and really thankful to everybody that's made this possible," Abby said earlier in the morning. "(I have) a healthy respect for the ocean. You can't go out and sail without that. My parents wouldn't let me sail if I wasn't scared and didn't know what I was getting into." Critics accuse Laurence and Marianne Sunderland, parents of seven children, of irresponsibility for letting Zac and Abby take such risks. The Daily News published angry letters to the editor after the newspaper named Zac and Abby as local "Sportspersons of the Year" for 2009. Laurence choked up at the press conference while expressing gratitude for the support the project has received. Responding to naysayers, the British-born Laurence said: "You know, the bottom line is, every kid will learn to drive. Do we stop them from driving because they might have an accident? We're trying to protect the young so much that we stifle their development. ... This is years in preparation and years of work, and I'm very excited for Abigail." Said Abby: "The boat's set up as well as it can be. Part of being mentally prepared is knowing ... there are going to be great times out there, (but) there's probably going to be times when I wish I wasn't there." She indicated she thinks many people doubt her ability to make the trip safely because she's a girl. Del Rey Yacht Club member Roberta Feldman, a Marina del Rey resident, said she had doubts about Sunderland before watching the teenager handle questions at the press conference. "(She's) very sophisticated for 16 years old," Feldman said. "I have great confidence in her now, rather than what I thought before (about) what she's capable of doing. I heard she was a timid little shy girl. Not really." The home-schooled Sunderland is taking along textbooks, as well as an iPod, cameras and a journal (she plans to write a book later), and necessities like six months' supply of dehydrated food, a water purification machine and 60 gallons of fuel for the sailboat's small motor. One hard thing about sailing solo is that you often can sleep for only 10 or 15 minutes at a time, Sunderland said. Reminded that sailing has been described as a combination of boredom and terror, she was asked how she'll handle the nothingness at sea. "I can always fish," she said. MARION, SC: An increasing demand for larger, series built yachts which offer elegance at an exceptional value has lead to the development of Beneteau’s most recent additions, the Oceanis 50 and 58. These grand sailing craft introduce the fifth generation of the modern cruising range from the world’s top builder, and they launch a striking style which mates new design elements with sophisticated yet functional ideas. Both the Oceanis 50 and 58, created by the teamwork of Nauta Design and the naval architects at Berret Racoupeau, feature a sleek profile with lean lines, a low coachroof highlighted by a long “eyebrow” window and a mounted mainsail arch. The injected GRP arch is ergonomically integrated into the design to blend into the overall taut lines, and as there is no need for a traveler track on the deck, it allows for the companionway to be larger plus it provides ease of movement throughout the cockpit and into the cabin. “It delivers a new interpretation of comfort and luxury under sail!” Said Bruno Belmont, Sailing Development Manager at Beneteau, upon testing the boats in their initial sea trials, where the performance was confirmed as continuing the trends to deliver ever faster sailing speeds with greater stability than predecessors of similar size. The sumptuous interiors are entered by gently-inclined companionways which open into enormous saloons with galleys that are more like full-size kitchens. Forward, splendid owner’s staterooms with ensuite heads provide magnificent space and numerous unique storage compartments. Both the Oceanis 50 and 58 offer a choice of layout versions for sailing couples or cruising with a bigger family. They also encompass detailing that is luxurious and contemporary with woodwork in lustrous, mahogany stained Alpi, LED lighting, and stainless steel with leather accents. Each living space has innovative features which are firsts, such as vast areas of deck translucency on the 58 which brings the outside into the warmth of her interior, or the energy stingy, bi-speed refrigeration system on the 50. The Oceanis 50, crafted at Beneteau’s Marion, SC factory, will make its North American debut at the Miami Boat Show taking place February 11th-15th. And while there, or soon after the show, there will be limited sea trial availability in the sunny climes of Florida. Don’t miss the opportunity to see this latest generation of Beneteau and perhaps sail her in beautiful blue seas! The Oceanis 58, produced in France, just made her debut at European shows. Beneteau USA, the American division of the world’s largest sailboat manufacturer, builds hundreds of 31-50 foot production sailboats in Marion, SC and imports power and sailing yachts up to 58 feet in length from its parent company in France.